Reiterating their commitment towards the nation, the Bank of Ceylon now contributes 1MWT Solar Photovoltaic energy to the national grid. This is probably the first time a state institution has gone beyond its core business to generate value of this scale for the country as an act of social responsibility. It was generated with a view to reducing the energy consumption of the Bank along with its branch networks and to support the national energy crisis as a gesture of commitment and concern towards environmental sustainability. 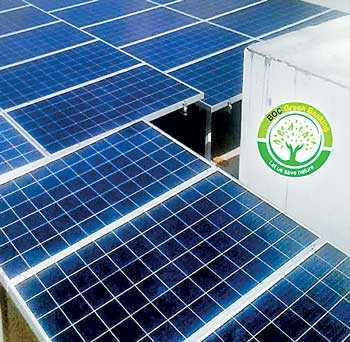 This 1 MWT solar photovoltaic energy was released with the connection BOC Nugegoda branch as the 27th BOC branch to be converted to generate solar energy. The ceremony marking the Nugegoda branch connecting to the national grid took place recently with the patronage of the CEO/ General Manager Senarath Bandara. Finance and Planning Deputy General Manager Vipula Jayabahu, Sales and Channel Management Deputy General Manager C. Amarasinghe, Support Services Deputy General Manager W.I. Hettihewa, Retail Banking Range 1 and Range 2 Deputy General Manager D.M.L.B. Dassasnayake, Members of Corporate and Executive Management, together with Western Province South Assistant General Manager Sampath Perera and the branch staff were also present at the event. The pilot project in this regard was carried out in the Thissamaharama Branch, and with its success, was subsequently rolled out to 27 BOC branches. Soon this initiative will be taken across to another 15 other BOC branches, completing 42 branches altogether in the first phase of this project. An outcome of 1MWT renewable energy generation capacity is expected eventually to lead to the generation of 1.387 million units (1,387,000 kWh), offset CO2 gas emissions by 1,205.3 tons, save 13,854 trees and Rs. 27.74 million annually. Envisioned to be the catalyst for sustainable development through social, environmental and economic bottom line, their mission is to stay on the course as ‘a responsible corporate citizen by operating the business in an environmentally responsible, socially equitable and economically sound manner’. Improving social and economic wellbeing is an integral part of BOCs core operations. Leading the Sri Lankan banking industry with over 79 years’ experience, the Bank of Ceylon has become the most stable and the trusted bank in the country, helping Sri Lankans build their lives and make themselves financially stable whilst uplifting the country’s economy.